Sunday? No, really, is it? Oh dear, I had so much I wanted to get done! But today is rainy, and so no golf for A, so no afternoon to putter outside for me. Well, I guess I could, but it’s raining and cold and dreary. So I dyed yarn instead. Oh, and made brownies. I did change the bed and wash the old sheets, so I should get points for doing SOMETHING worthwhile! The yarn is more teal and blue – I decided to make the lefties shawl with the yarn I dyed last time, but I thought I would like to have a set of gradient colors to do it with. So, I mapped it out, and decided I needed aquamarine over-dyed with teal, blue, and blue over dyed with teal to go with what I already have. All of those are hanging out side now, “drying” in the rain. All I have to do is wind some natural, wash it and dry it, and I am good to go. We will see how long that takes, right? This week I started another double knit buffalo checked cowl, based on the Trapper Cowl in Interweave Knits last winter. Since I was doing it with a vague recollection of the instructions, and was too lazy to go upstairs and get the magazine, it is a bit different, but close enough that I can’t take credit for the pattern. I am using some Quince and Co Lark, in Peacock and Bird’s egg. So far, so good! I blocked a few quick knits I did this week – three bracelets, a necklace and a thing that might be a shawl – I think I mentioned I was knitting something with the beet dyed yarn? 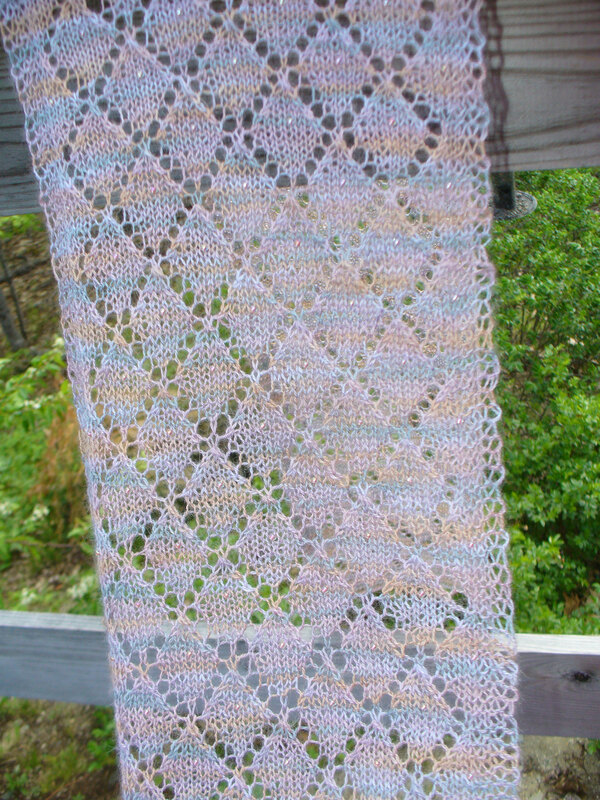 What I did was the lacy leaf shawl, but I didn’t want a triangle, so I added a third section of leaves. It was easier to do than I expected – I started by casting on one more stitch, and so had two “center stitches”, then I just followed the instructions, essentially. I didn’t have enough yarn to go far with it, but I like how it came out. Kind of a half circle, or a butterfly. 🙂 Pictures will come eventually (I mentioned it was raining, right?) If only it wasn’t so orange. Maybe I will over dye that, as well! Or just put it in the giveaway box. Not sure how I like the experimental bracelets ether, but they did work. I used some of the leftover yarn from the lace scarf I finished last week (and mailed off Friday, it definitely should arrive in plenty of time for the Tuesday birthday!) If I like how they came out, I will pop one off to the scarf recipient and sell the rest. Or at least, put them up for sale! That is about all that is new – a quiet weekend – the last one for a while! Author salpal1Posted on May 31, 2015 May 31, 2015 Categories how I spent my day, how it came out, what I am thinking about makingTags rainy sunday, yarn4 Comments on Sunday? No, really, is it? I decided to sleep outside on the porch tonight. The sky is pretty, it isn’t going to rain and it’s nice and cool. Perfect night for it! For a short week, it seems like a long time since I was here. Not much is new, our quiet weekend is filling up, though. Car appointments, breakfast with family while we wait, errands and chores. Then off to Orono for niece E the elder’s School performance. Sunday a plays golf while I play in the yard. And boom! The weekend is over! Oh how I miss my Friday’s off! I have done some research on spinning lessons and found some nearby. 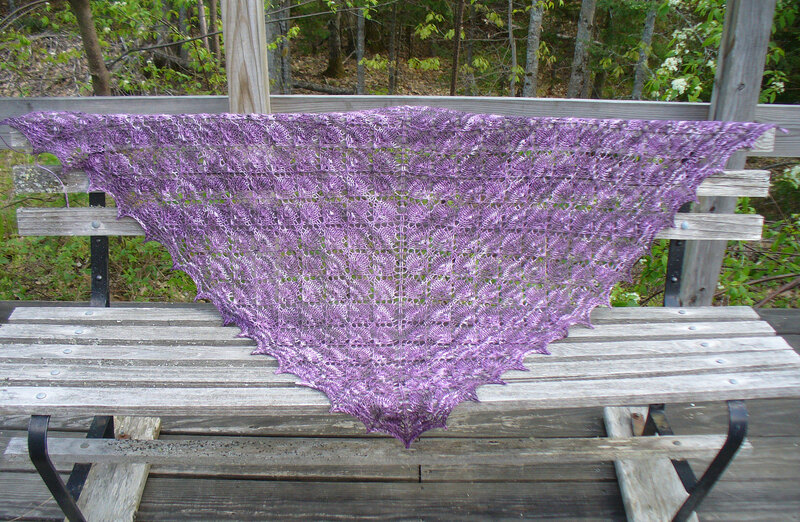 I will check out the woman next week at Fiber Frolic, so that is exciting. Just going there next week will be exciting! Actually there is lots going on over the next few weeks. But we will take it one week at a time! I will try to find time this weekend to show you what I am working on now that I have finished the long scarf- something to look forward to! After spending Saturday with A’s immediate family, we traveled on Sunday for a couple of hours to a lovely part of the coast to spend the afternoon with her extended family – Cousin C recently moved into a great place on Orr’s Island, and invited us down, along with a few other cousins, and two aunts and an uncle. It was nice to see everyone, and get to know the other cousins better. Always good to see the older generation – of ten originally, only 4 are left, and sadly, three of the four have dementia at some stage or another. So we saw the one aunt who at 90 is sharp as a tack, although deaf, which can sometimes cause confusion, and the youngest of the ten who is still able to function and share a joke easily, and his wife who has her hands full keeping things going forward. It was a pretty day – although we had some showers, it was mostly nice and sunny and breezy. Cousin C has a spinning wheel. And two rigid heddle looms. She tried to sell me a loom but I resisted. I might not have been able to resist a wheel had she offered. 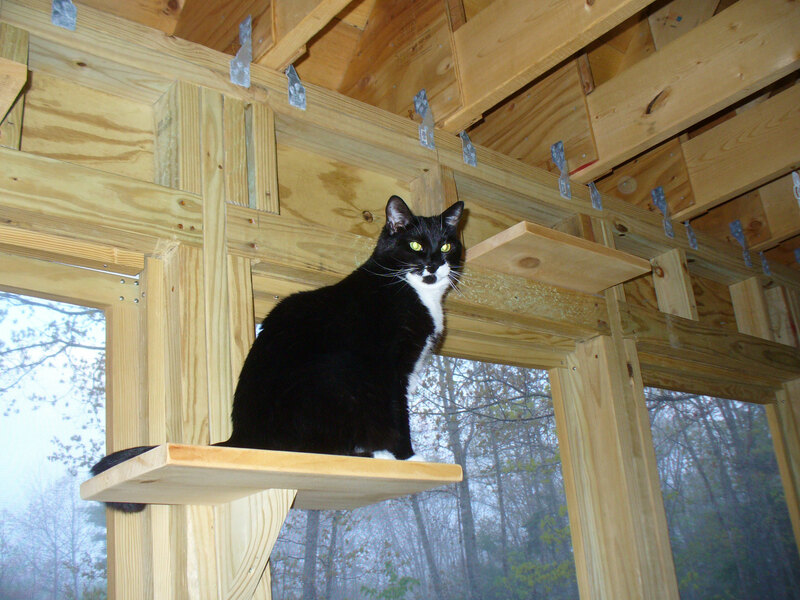 She is thinking of having fiber weekends at this new place – it is spacious and has a large sunny deck. I told her to please include me if she does it. A rolled her eyes. On the way back, we stopped in to visit with Mom and B. Mom’s eyes are doing really well – she has no had both cataracts removed, and can really see well. She can’t wait to get her new glasses but she has to heal a bit more first. I also vacuumed about a third of the house, and will work on the rest of it when I cool off from doing that – it is warm today! And I will go dig out rocks for that pool area – today is a day I would like to have a pool up and full. Good motivation. 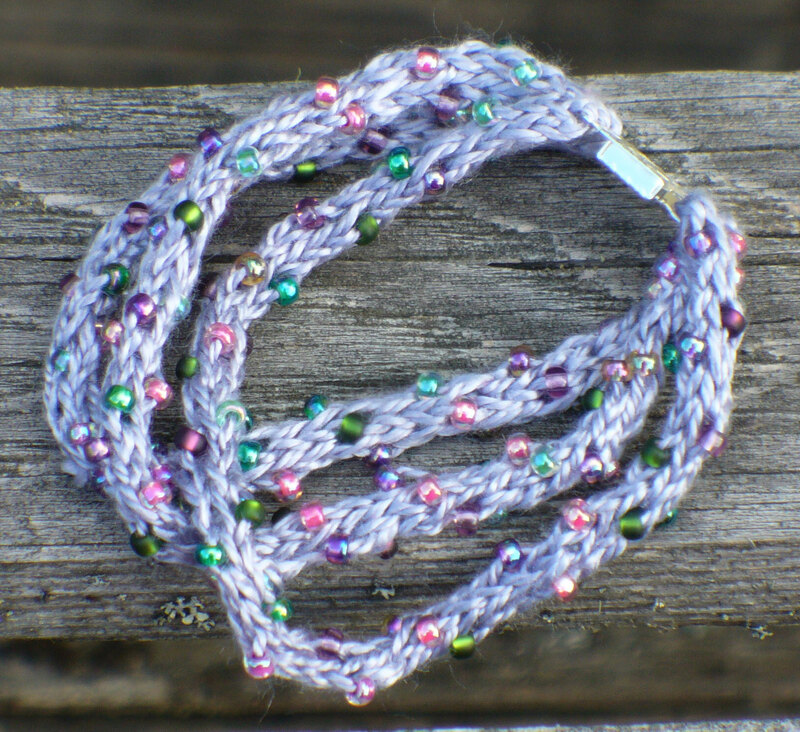 I also finished a little bracelet to match C’s birthday scarf. Not sure if the bracelet will be for her, I will see after I block it if the size is right. Author salpal1Posted on May 25, 2015 Categories how I plan to spend my day, what I am thinking aboutTags dementia, family, household chores, planting the garden3 Comments on Such a nice weekend! Textile Shed asked me how I dyed that yarn. By the seat of my pants is the short answer! For a longer answer, read on. 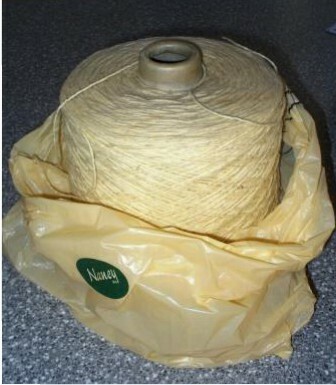 First I washed the yarn – this is natural wool yarn from the giant cone that has been stored for a long time here, and who knows how long at Nancy’s. It has been wound tight for that long as well, so benefits from a gentle wash in cold water with some mild detergent. I used about three ounces of yarn in each skein. While it was soaking I put about 6-8 cups of water in my dye crock pot (never used for food) and let it heat up. After about half an hour, I put a couple of chugs of liquid RIT dye in the crock pot. I did NOT stir much as I wanted some variation in the yarn. The first one I did was the teal, and I used more dye than I needed, as it turned out. 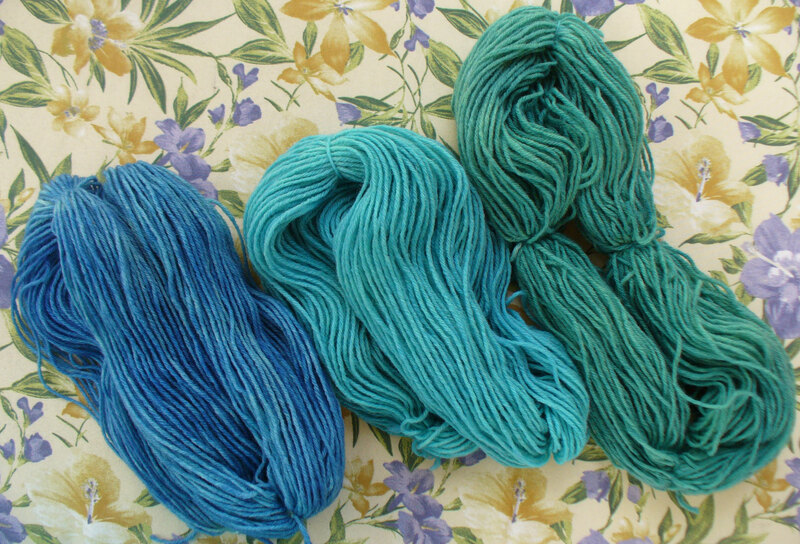 So the next one, I used less (the aquamarine) and the third, even less ( aquamarine over-dyed with royal blue). I drained the water from the yarn, but did not worry too much about getting all the vinegar water out, then I put the yarn into the crock pot (not stirring or worrying if colored water was over it all. I added water if needed, again not stirring, put the lid back and came back in half an hour. I pulled out the yarn, judged whether or not I liked the color, put it back in. They take at least an hour, the teal was a bit longer, I think. Once I liked the color, I put it in the sink to drain and rinsed it with increasing colder water ( to bring the tem of the yarn down gradually) until I was rinsing in very cold water. I did this until it was running clear, and I put vinegar in the last rinse, just to be safe. 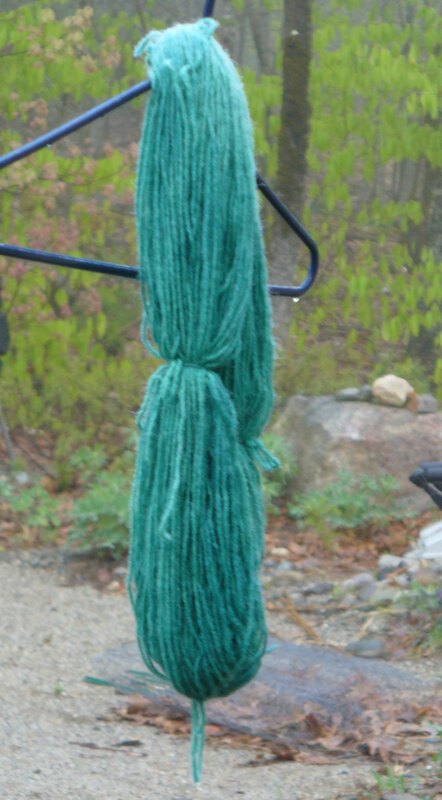 Then I hung the skein to dry. When I did the aquamarine, I had a second skein soaked and ready to go in the pt, so it used up the rest of the ye in the water – but when it did, the yarn was paler than I wanted. so I put a glug of the royal blue in the same water and left the yarn in there fro another half an hour. I can see places where the aquamarine and even natural color show through – so I got the variegated I was looking for, but maybe more blue than I expected. I still have plenty of the dye left in the bottles, I think I could do each color three or four more times with what I have, so I will do more experimenting with it. I also have a box of the powdered dye in fuchsia (if you recall what started this whole thing it was trying to dye yarn with beets to get that glorious color, but getting reddish brown. Which I would have known if I had explored the internet.) Anyway – I have not felt like dealing with mixing that up into a liquid yet. The other colors I bought the liquid dye already prepped. I used teal, aquamarine and royal blue dyes. I am not a big lover of chemicals, but just could not resist all those glorious colors at the hardware store. 🙂 And it seems to be easy to do. Author salpal1Posted on May 25, 2015 Categories how it came out, what I am makingTags DIY, dying wool yarn, how to, rit dye15 Comments on How did I do that? With A gone, this week has been somewhat different. It turns out I have only one cat, and that one only part-time. Zumba has gone into a complete state of mourning, I have to call her for meals. Today I tried playing with her before work, she just sat in her box of tissue paper and looked at me. Allie, on the other hand has decided that she likes being the only cat of the only person, and is very lovey for about ten minutes at night and in the morning, then she, too disappears. They will be beside themselves when A rolls in tonight. I also slept with the windows open. And left the bedroom windows open when I went to work. And stayed up until NINE O’CLOCK. And scooped the cat box everyday. And did some laundry. And all the dishes. And OF COURSE I miss her and can’t wait for her to come home. One of our anniversaries was Tuesday – the second of legal marriage – and she wasn’t here. 😦 We will celebrate this weekend with a meal out, and I will be happy to cede back to her all her morning chores, I had a tough time getting out of the house each morning. But I did, and it was always worth it, we have had such beautiful mornings this week! 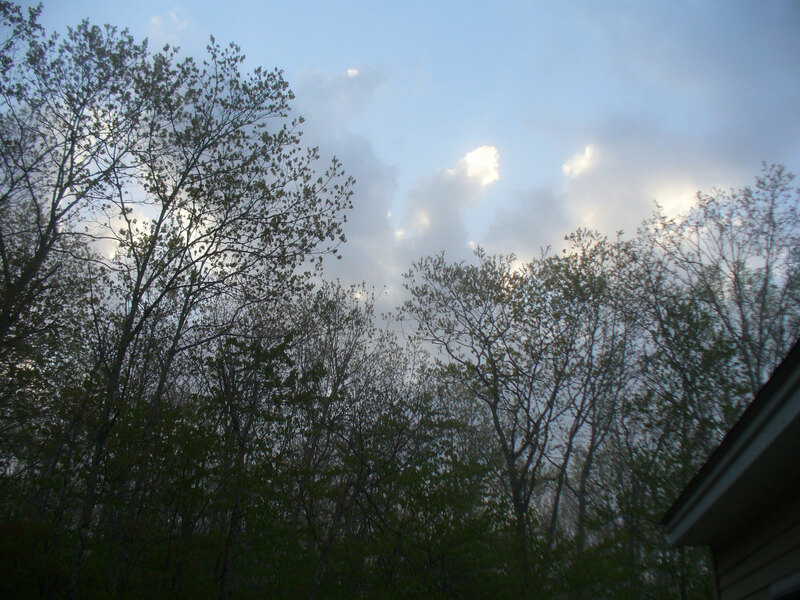 Yesterday was misty down low, but a beautiful sunrise (I got a photo of it which I will share when I clean off the camera this weekend) so the clouds just glowed. Today was equally pretty – a fine, clear morning. All the leaves are growing fast, and the world looks much more hopeful than it did a few months ago! 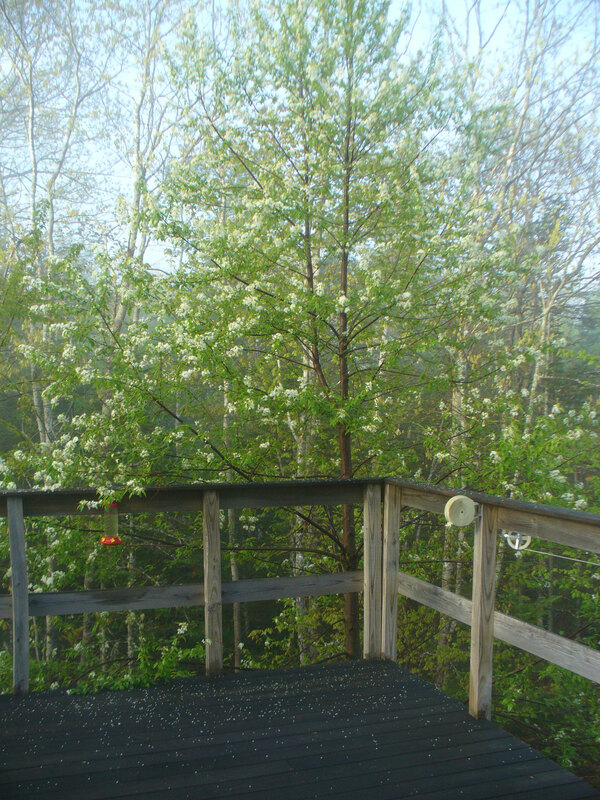 The wild pears and cherries are blooming, I noticed many buds about to pop on my neighbor’s apple tree. 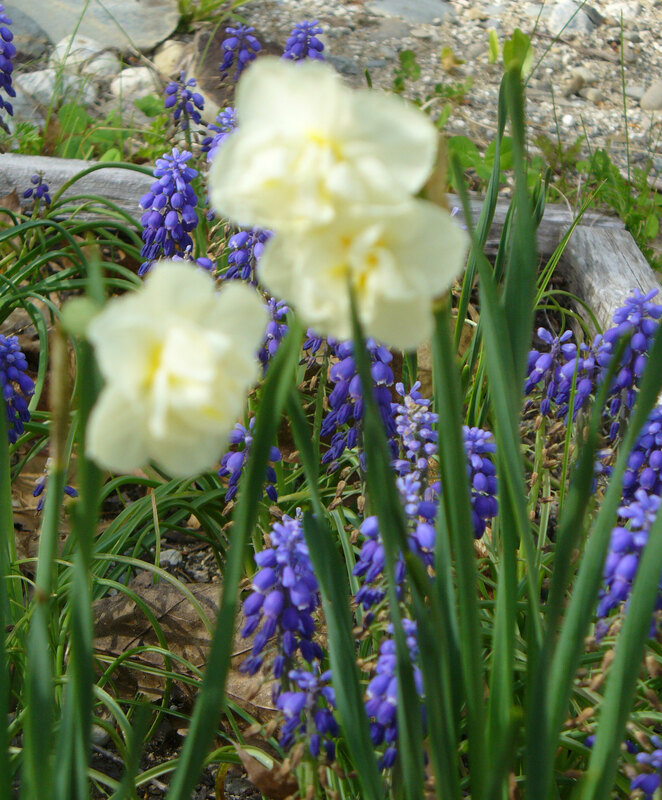 Things are late, but they are blooming. 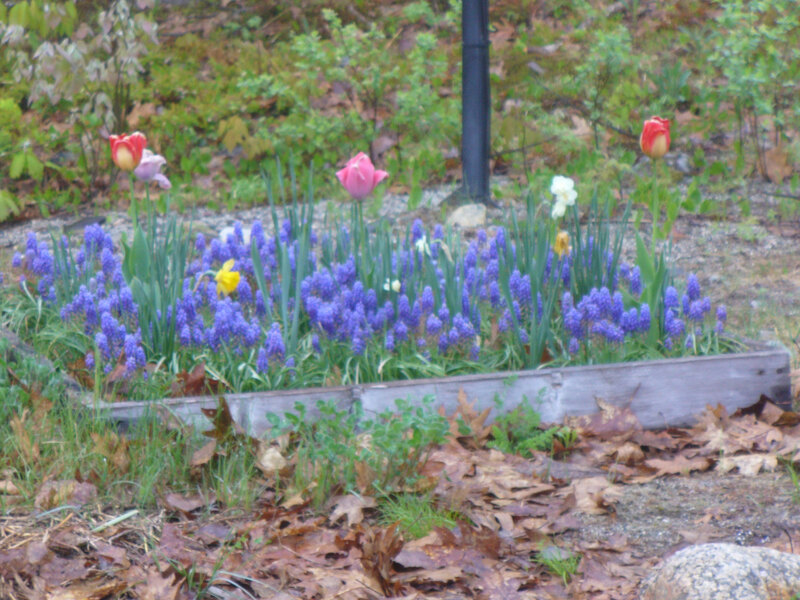 I doubt we will have lilacs this weekend, or lupines in a week, but they are trying. And A comes home tonight. Isn’t life good? But I DID get the cool weather seeds planted – two kinds of peas, lettuce, mesclun, carrots, radishes, and some experimental pumpkins (might be too early for them, only time will tell.) 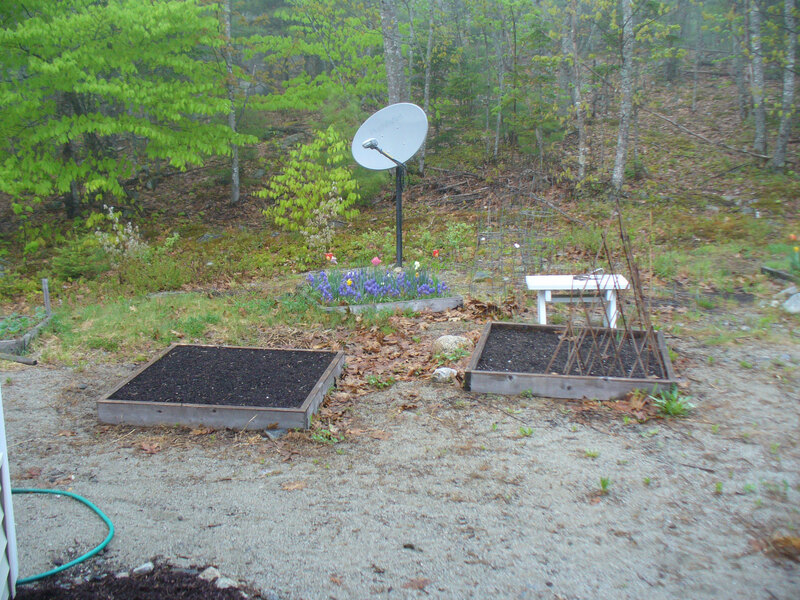 Got them all in their tidy raised bed and watered them so that it could rain today. 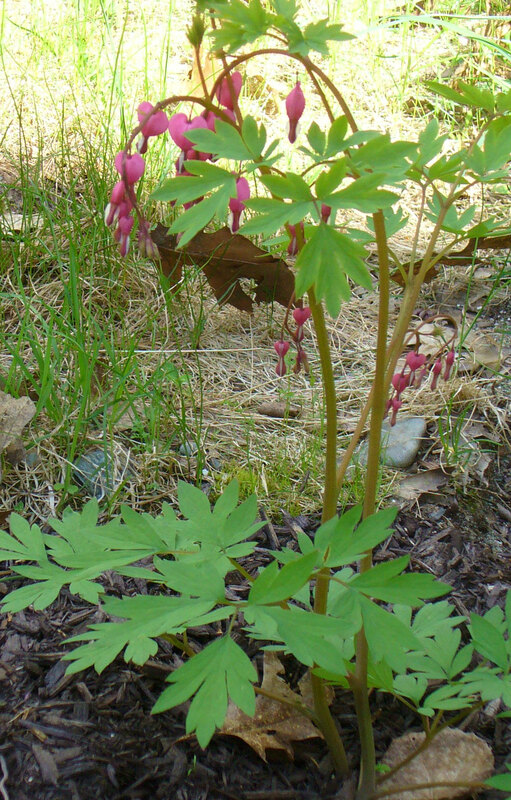 It is amazing to me just how dry the ground was – all that lovely snow melt is long gone. I did cook up the first stalks of asparagus and they were delicious! I can see that we will be eating a lot of that over the next few weeks, the plants are throwing up stalks every day! 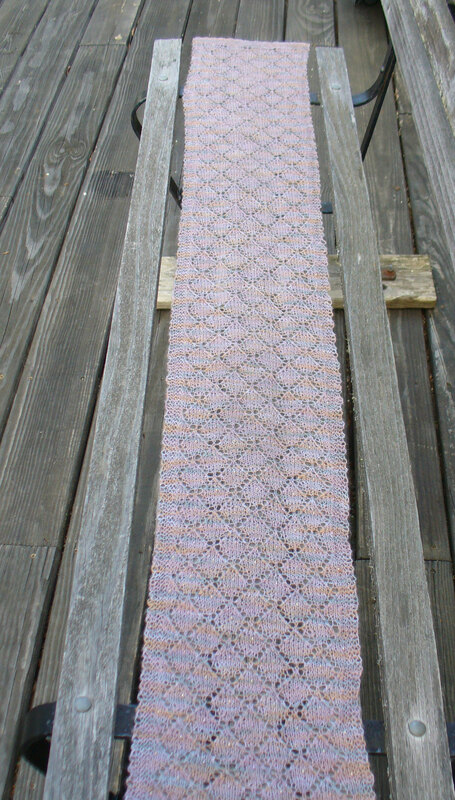 I also finished the endless scarf! I finally decided that when I block it, it will grow in length and enough is enough. 🙂 I have some of the beads and yarn left, so will likely make a small bracelet to match it. The kids had a mouse last night. No clue where it came from, but I know where it wound up! They both were acting like something odd was going on when we went to bed, but they sometimes go gaga over a fly, and we hadn’t seen anything running around, so I ignored it. Until 4:30 when the light was snapped on and A was moving books off the bookcase in our room. “Whaaa?” “I think they have a mouse” Sure enough, they did, and she caught it in a margarine tub. It is outside now, the cats are sleeping it off. I guess they played with the poor thing ALL NIGHT. I hate that they are so mean to a creature, I wish they would just go ahead and kill the thing. But at least they have remembered that they should be hunting. Now if they would just get the giant creature that runs through the soffits and into the bathroom ceiling. Today we are doing fun things like going to the dump and grocery store – but we also are going out to breakfast, and then I hope, to the hardware store. I need some dirt, tomato plants, and they had a nice little trellis that might be just the thing for some sweet peas, and they carry fabric dyes which I want to check too. See if I can make a nice fuchsia that doesn’t smell like root vegetables. 🙂 But I bet when I get there and start reading labels I change my mind and come home and see what I can do with Kool Aid and food coloring.